When the VC10 fleet left RAF Service, the VC10 schoolhouse at RAF Brize Norton was also closed down. 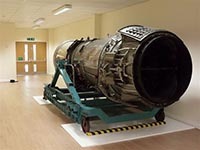 All the training aids found new homes with the beautifully cut-away Conway engine (which was prepared by BA apprentices in 1981) moving only a short distance to the newly formed RAF Brize Norton Heritage Centre. The Heritage Centre aims to tell the story of the station from the early days in 1937 to its present day form, including its functions, the USAF involvement and of course the based Squadrons and aircraft types. It is currently still in its infancy but more artefacts are being located and a small team of volunteers has already been assembled. The new releases for December 2014 include a 1:200 scale model of VC10 C1K XR808 'Bob' in its anniversary scheme. There is a chance that the mould for this model is similar to the one used for earlier JC Wings releases. Gemini's 1:400 scale models were pretty good and initial images of the new model do not disappoint. The model should hit the stores this month, depending on where you order it might be in time for Christmas but chances are you might get it in January. Update: The model has been seen in the flesh... it doesn't disappoint in overall details but sports one major mistake in that it has a centerline HDU which should not be present on a C1K! And we're one year on... on 25th September 2013 ZA147 flew for the last time, closing the book on the VC10's flying career. The photo below shows one of two go-arounds that she performed before landing at Bruntingthorpe. Within this year we've gone from an active RAF fleet to several preserved airframes (or sections thereof). ZA150 is active at Dunsfold and owned by the Brooklands Museum, ZD241 was lovingly restored to running order under the care of Gary Spoors' GJD Services and their team of volunteers and has starred in two Cold War Jets days. ZA148 is with the CAF at Newquay and the nose section of XV108 is at the East Midlands Aeropark. XR808 is slowly being prepared for its move to Cosford and ZA147 is also still at Bruntingthorpe although its future is less certain. For now she's a spares source for ZD241 but it is not clear if she will stay in one piece. Still, we can count 8 airframes in one piece (including G-ASGC at Duxford, A4O-AB at Brooklands and G-ARVF at Hermeskeil), substantial pieces of three more in museums, and that from a production run of only 54. That's a very good result, but there's still a lot of work needed to keep these airframes with us. 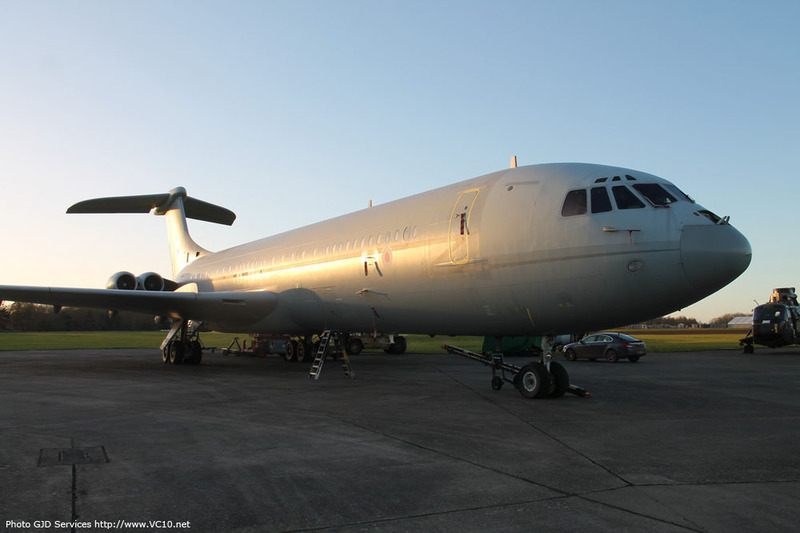 So if you're enthusiastic about VC10s, get in touch with the nearest museum that has a preserved example (if you haven't done so already) and see how you can help! Also, I'm still very much interested to read your stories and see your photos if you'd like to share them on this site. 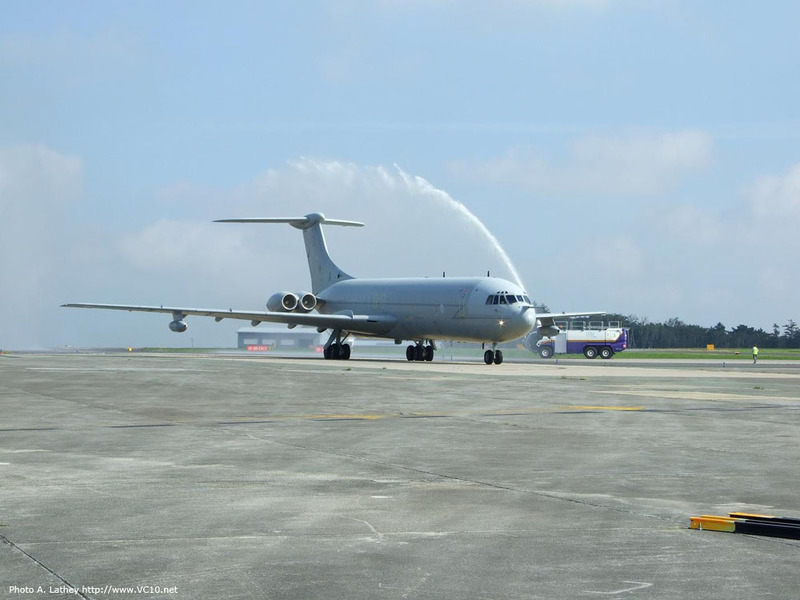 It is still important to preserve our memories of this wonderful aircraft so that other generations can also enjoy that special feeling we know as 'VC10derness'. It has been a year in the making but it now seems official: GJD Services will move XR808, also known as 'Bob' after the last three digits of the registration, to Cosford by road. The contract has now been awarded to the company according to a special Facebook page that has been set up to document the project (see link above). This will be a huge undertaking. Taking a VC10 apart with care is not an easy task and the airframe will have to be broken down into several sections to fit past all the obstacles between Bruntingthorpe and Cosford. It is wonderful to see that the RAF Museum and GJD have taken on this challenge and through this, will ensure that XR808 will get its well deserved place of honour in the RAF Museum. Sunday 24th August will see the second open day at Bruntingthorpe airfield. As with the previous edition this season you will be able to see fast taxi runs from the based jets up close, including VC10 K4 ZD241 which will run at the end of the afternoon. With Dunsfold's event on Saturday 23rd and Sunday 24th you could visit two VC10s in one weekend! On this upcoming bank holiday weekend Dunsfold will once again host the Wings and Wheels event. This will be the next opportunity for those of you who would like to get up close to a VC10 as ZA150 will be open for visitors. The number of tours through the VC10 is limited and they can be pre-booked over the weekend on a first come first serve basis. 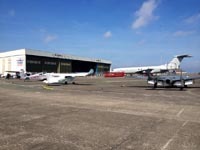 The small fee of GBP 2 per visitor will greatly assist the team in keeping the aircraft live and in the great condition in which it was delivered. Originally the plan was to have the aircraft perform a taxi run during the event but unfortunately organisational issues are preventing this. Although this may be dissappointing, we must remember that there are quite a few pieces of the puzzle that need to be in place for this to happen. And on the bonus side, this will enable more people to get up close and personal with the VC10. There are still a lot of good reasons to visit Dunsfold this weekend: the worlds only two airworthy Lancasters will be there, the only airworthy Vulcan and Canberra, the Dutch B-25 Mitchell will be there to commemorate the operational flights of 98, 180 and 320(Dutch) Squadron Mitchells from Dunsfold during WW II, and many more exciting displays. For more about the VC10 tours see the link above. Sunday May 25th was a wonderful day to be at Bruntingthorpe as many of the based jets were shown off to the visitors and performed taxi runs on the runway. Highlight of the show was the first public taxi run by VC10 K4 ZD241 at the end of the day. The crew ran the engines up on the brakes and allowed the aircraft to reach 90 knots before chopping the throttles and taxiing back to their parking place accompanied by the noise of car alarms going off. The run did prove to be too much for one of the tyres but this was soon changed with the help of some of the volunteers from the The Buccaneer Aviation Group. More photos can be found in the forum. Next Sunday is one of two planned open days at Bruntingthorpe, or Cold War Jets Day. During this day VC10 K4 ZD241 will perform a taxi run along with many other based jets. This will be the first public appearance of a preserved, live VC10 although both ZD241 and ZA150 have been taxied since their retirements. There will most likely be an opportunity to visit the inside of ZD241 before and/or after her run, which is scheduled as the grand finale of the day around 3:30pm. The first AGM of the VC10der Loving Carers group is planned on the preceding day (Sat 24th) with the aim of setting up a formal group to help preserve and run ZD241 for many more years. For more details about this see this page on the forum. On the 9th May news emerged that 'Jock' Bryce had passed away on 7th May 2014. Born in Glasgow in 1921 he joined the RAF in 1939, flew during WW II in various squadrons until being posted to the King's flight in 1946. In 1947 he joined Vickers Armstrong as a test pilot under 'Mutt' Summers, later moving up to the post of Chief Test Pilot. Jock was captain or co-pilot for the first flight of eleven prototypes, including the first VC10 G-ARTA on 29th June 1962. He will be laid to rest in Leatherhead on Friday May 23rd. On the 1st May ZD241 was fired up and then moved under her own power towards the runway for a trial run. The airframe is scheduled to be one of the main acts for the upcoming Cold War Jets day at Bruntingthorpe airfield on Sunday 25th May. After a request for willing helpers on the forum here a few weeks ago, 31st March turned out a very productive day at Bruntingthorpe with a very pleasing result. ZD241, ex-BA G-ASGM, is alive again and has had all four engines running. After the first engines were hung back on the airframe last December, a lot still needed to be connected on this front. 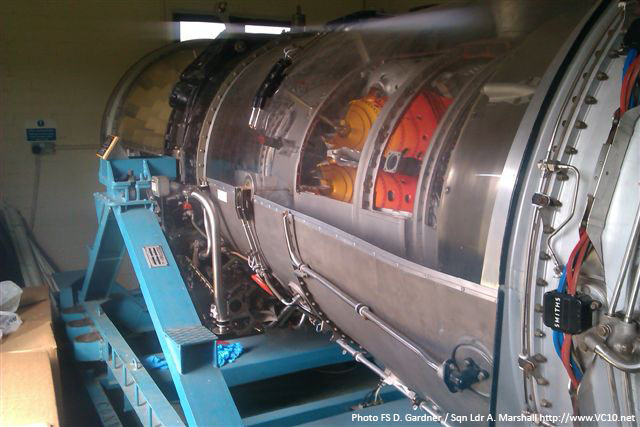 With all four engines in the airframe work focused on the plumbing for fuel, oil, hydraulics, and other assorted items. After this had been done the engines were dry cranked using the APU as a bleed air source. 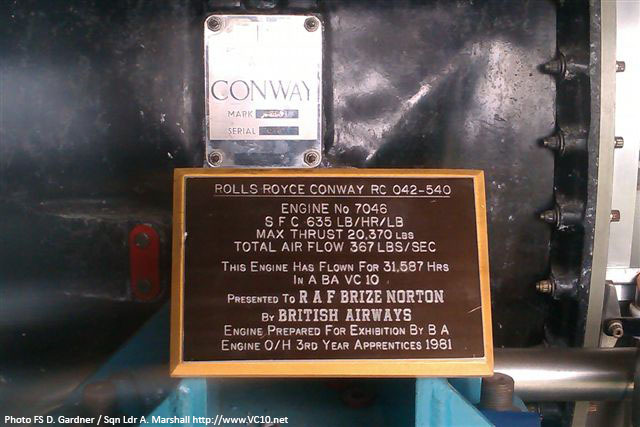 When this produced no obvious snags the next step was taken to start up the four Conways. With these running the flight controls, flaps and slats, tail plane incidence (TPI) and brakes were checked before everything was shutdown again. The footage below shows some of the checks, see the link above for more images including movies of the engines starting up. My name is Gwyn Mullett and I was born on 27th January 1946 in Montreal, Canada. The family moved to Bristol, England in 1949. In 1953 we moved again to the town of Wokingham being about 30 miles to the west of the new London airport named Heathrow. It was here that I grew up completing my education and, in 1964, qualified to go to the College of Air Training on the south coast at Hamble, near to Southampton. I graduated in the summer of 1966 and joined BOAC in the August. I started my airline life flying the superb Vickers VC-10. In 1968 I qualified as a Flight Navigator and ended up both flying and navigating up to 1971 when I converted onto the new 747 that had just been delivered from Mr. Boeing. In 1976 I went back to the VC-10 and completed a command course that year and became the youngest Captain since 1949 in the airline. 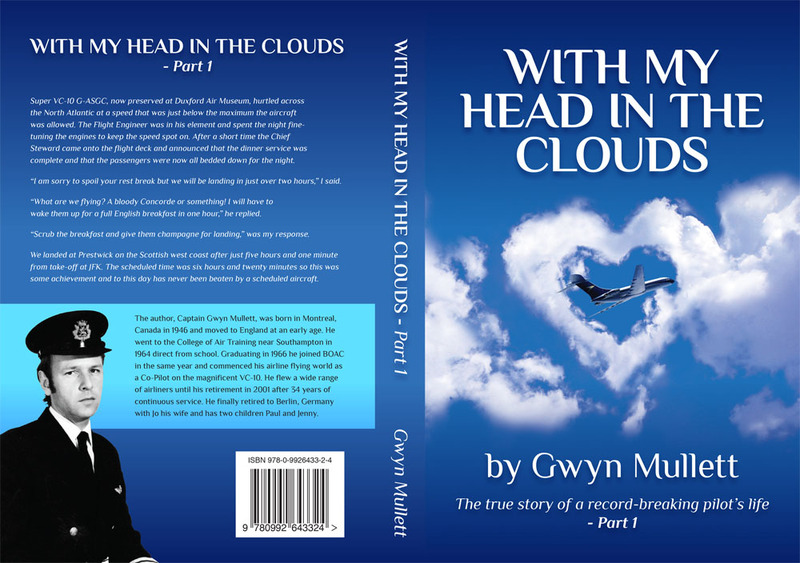 My book is called ‘with my head in the clouds part 1’ and covers from the cradle to the end of 1979 when I finished my flying on the magnificent VC-10. The book will be printed on demand and because of this Amazon may sometimes say that it is not in stock. If you place your order it will still be dispatched as soon as possible. The US Amazon site now also offers a Kindle version for your e-reader. Ever since ZA150 was delivered to Dunsfold Aerodrome in Surrey she has been cared for by a team of enthusiastic volunteers from the Brooklands Museum. On Friday the 13th December this culminated in a demonstration for the trustees of the museum and some invited guests where the sound of four Conways could once more be heard. All four engines were fired up, with help from a ground power unit that was kindly supplied by Virgin Atlantic and an air starter that was borrowed from British Airways, and all flying controls were exercised throughout their full range. At a later stage two engines were once more fired up and the aircraft taxied a few yards to rotate the tyres. The aircraft has been put to bed now for the Christmas season but in the new year this will certainly be repeated! Accomplished aviation photographer Peter Foster has been involved with the VC10 for a long time, having flown on the aircraft regularly to photograph other types and other VC10s. He has now bundled many of his wonderful photos together in one book which is available through the Blurb.co.uk publishing service. The preview which is available through this link shows the entire book, but for the full effect it is best to order a copy for yourself. The book is available in either a soft- or hardcover version. The captions, short texts and anecdotes as well as the photos itself serve to tell the story of the 28 VC10s that served with the Royal Air Force between 1966 and 2013. A fleet listing is included but what stands out are the beautiful photographs that pay tribute to the wonderful design that is the VC10. Update: it was a bit of a silly quiz and I found out later that the photo wasn't displaying properly but wat is shown here is that ZD241 has had some engines installed. The airframe had its engines removed when it arrived at Bruntingthorpe but as it is destined to stay there as a live airframe it has had engines from ZA147, which is currently being taken apart, installed on the airframe. 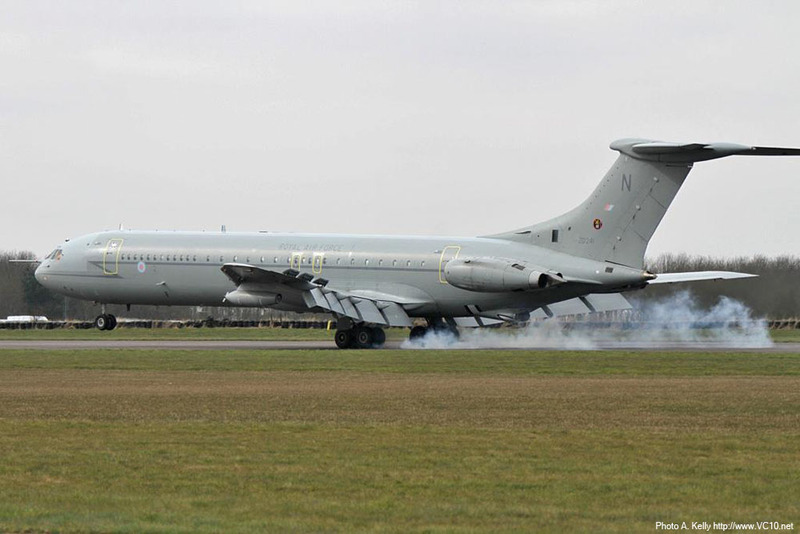 Earlier this year Morayvia tried to purchase the last VC10 K4, ZD241, but unfortunately did not manage to secure the needed funds. Around the same time they organised a limited edition Glen Moray malt whisky. This is limited to 242 bottles, each of which in a smart presentation box with a numbered label. Included is a leaflet which describes the VC10's RAF service and the two squadrons that operated it. All the bottles were flown on VC10 K3 ZA147 and this is reflected on the label. The fact that the aircraft burst two tires on landing was a bit worrisome but all the bottles were unscathed. Moryavia are now trying to acquire the front fuselage of this same ZA147, the VC10 K3 that made the last ever landing of a VC10. They would welcome any donations to help them with this purchase and the needed costs for transporting this fuselage section to Scotland. As there are still some Whisky bottles available from the original run, purchasing one or more will help them in preserving this VC10 front fuselage, and it makes a very nice Christmas present too. The whisky is a Glen Moray, 10 year old, Cask strength (60.1%) single malt, drawn from a single cask by hand. Bottles are sold for £90 plus postage and packaging. All the proceeds will be equally divided between Morayvia and the RAF Benevolent Fund. For orders please contact Bob Pountney through e-mail. When GJD Services started work on dismantling XV108 in September 2013 the forward fuselage of this VC10 C1K was removed just in front of the wings and set aside. 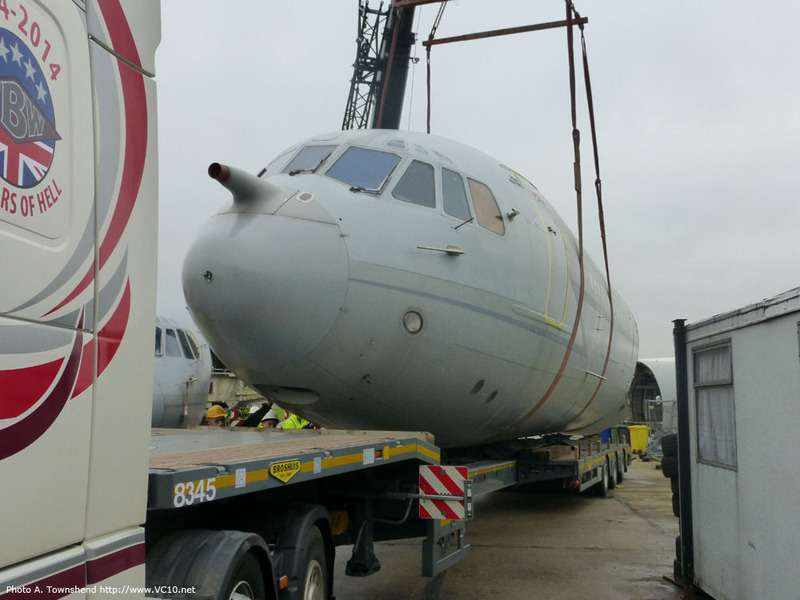 On November 16th this complete front fuselage was loaded onto a low-loader and transported to the East Midlands Aeropark, arriving around 15:00. At this museum and viewing area the front fuselage will be put on display, it is hoped that the interior can be restored to how it was configured when in service. Now that the VC10 has made its last landing, the complete history of this iconic aircraft can be put to paper. 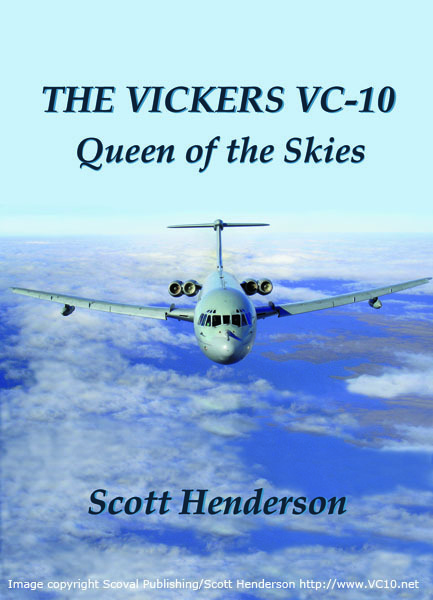 In a sequel to his popular 'Vickers VC10 - Silent, Swift, Superb' author Scott Henderson is now working on 'The Vickers VC-10, Queen of the Skies' which will be available in 2014. VC10 Tribute Shirt available again! In August the VC10 tribute shirt became available and the original batch of 31 shipped out in time for the photocall event at Brize. At RAF Brize Norton, Dunsfold and Bruntingthorpe these shirts were prominently present to salute the VC10's 51 years of service. There is now a second and last chance to order one of these shirts (or more than one). The design features a white polo shirt with a VC10 on the back and a Vickers-Armstrong logo on the chest. You can buy this shirt at cost price or for a slightly increased price in which case all the profits will go towards the upkeep of a live VC10 at Bruntingthorpe. So visit the thread in the forum (see link below or above this message) and order yours now! If you don't want to sign up for the forum just for this, e-mail me with the needed details and I'll relay the message. VC10.net forum - VC10 Tribute Shirt - NEW ORDER! During the 'VC10 retirement' dinner at RAF Brize Norton on 20th September 2013 two donated whisky bottles, numbered 10 and 101 from the limited edition produced by Moryavia, were auctioned off for charity, netting the RAF benevolent fund £1003. If you'd like to get one of these whisky bottles for yourself (for the original price! ), some are still available. See the post below for the details and e-mail address. Touching down at Bruntingthorpe at 16:02 after two loud go-arounds, ZA147 closed a chapter of the aviation history book which has spanned 51 years. Ernie Marshall, chief designer for the VC10, stated that he wouldn't be surprised to see a VC10 flying in 50 years and thanks to a few extensions to its service life it managed a career of 51 years and 3 months. More photos on the page about 5H-MMT / ZA147. With ZA150's delivery to Dunsfold yesterday there is only one VC10 flight left on the cards and that will be ZA147 which will go to Bruntingthorpe today. From 10.00am on people will be allowed on the airfield to view this landing which is scheduled to arrive around 12:30LT. Please note that the weather may cause this time to change. Dunsfold Park and Brooklands Museum are pleased to announce that the last Vickers VC10 will arrive tomorrow (Tuesday 24th September) at its new permanent home, the famous Surrey airfield. The VC10, which carries the RAF serial number ZA150 was the very last VC10 of 54 built at Brooklands in the 1960s it is one of the last two flying with the RAF from Brize Norton in Oxfordshire and being retired this week. The aircraft will be landing on the airfield at 12:30* with its six-strong aircrew and will be greeted by members of the aviation teams from Dunsfold Park and Brooklands Museum. The RAF bought 14 new VC10s in the 1960s for strategic transport and later went on to purchase aircraft retired from the commercial market, converting a further 14 into air-to-air refuelling tankers during the 1980s and ‘90s. 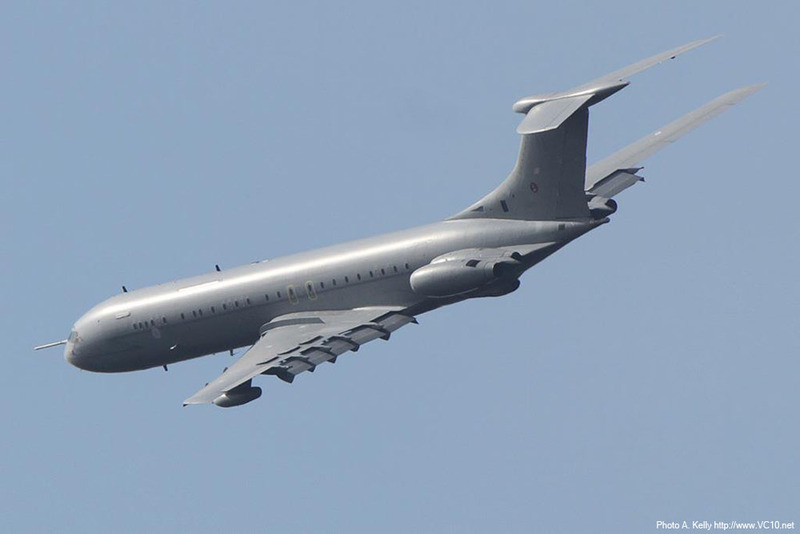 In total, the RAF has operated 28 VC10s of differing variants, and the aircraft conducted a range of tasks from troop and VIP transport, aero-medical missions and air sampling after nuclear tests. 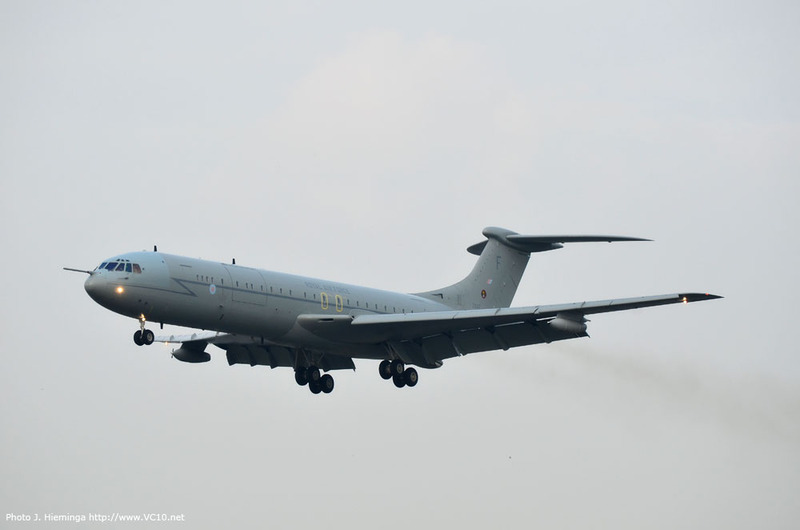 In recent years the VC10s have been used solely for air-to-air refuelling, with their last missions in this role having been completed on Friday 20th September. The VC10 becomes the second longest serving type in the RAF’s inventory with 47 years of service just narrowly eclipsed by the English Electric Canberra which was withdrawn in 2006. ZA150 was originally built as 5H-MOG for East African Airways as a “Combi”, based on the Super VC10 but with a large forward freight door – which, incidentally, greatly eased the conversion of this variant into a tanker aircraft, allowing five huge fuel tanks to be installed on the main deck. After its airline service was completed, this aircraft was stored at Filton for several years before making its first flight as a tanker in 1984. Dunsfold Park will be open for visitors wishing to witness this important arrival, with access via the North Gate off Stovolds Hill. Longer-term arrangements for public access to the VC10 at Dunsfold Park will be confirmed in due course. 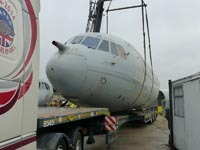 * The arrival of the VC10 at Dunsfold is subject to weather and operational constraints: please monitor www.brooklandsmuseum.com or www.dunsfoldpark.com. After this the aircraft will form up again for a fly past at RAF Brize Norton before landing around 14:00. After this trip the list of scheduled events for these aircraft is short. On Sunday one or both will be seen in a Photocall event at Brize and all rumours indicate that on Wednesday the last ever landing will be performed at Bruntingthorpe. According to received information the most likely date for the final flight to Bruntingthorpe is now 25th September 2013, arriving around 11am. Details will be confirmed later and this is of course subject to the weather and technical issues cooperating. With just two airframes left in service and the out of service date looming ever closer, it looks like next Saturday will see the last ever Air Show appearance for a flying VC10. One of the two remaining VC10s, ZA147 or ZA150, will join the static show for this Battle of Britain Air Show in Scotland. One of the RAF's last three active VC10s, K3 ZA148, left RAF Brize Norton at 9:10am today and flew South for a practice approach at Bristol before continuing to Newquay airport in Cornwall. Arriving overhead around 10:30 she performed several low passes before landing at 10:56am. This airframe started life as East African Airways type 1154 Super VC10 5Y-ADA and flew over East Africa for ten years before the collapse of EAA caused a reposession by BAC. After storage and conversion she flew again as a K3 tanker on 4th July 1984 and served the RAF for a further 27 years (having been delivered to 101 Squadron in 1986). 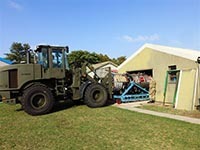 She will now be preserved at Newquay by the Classic Air Force. See links above for more photos of the arrival. 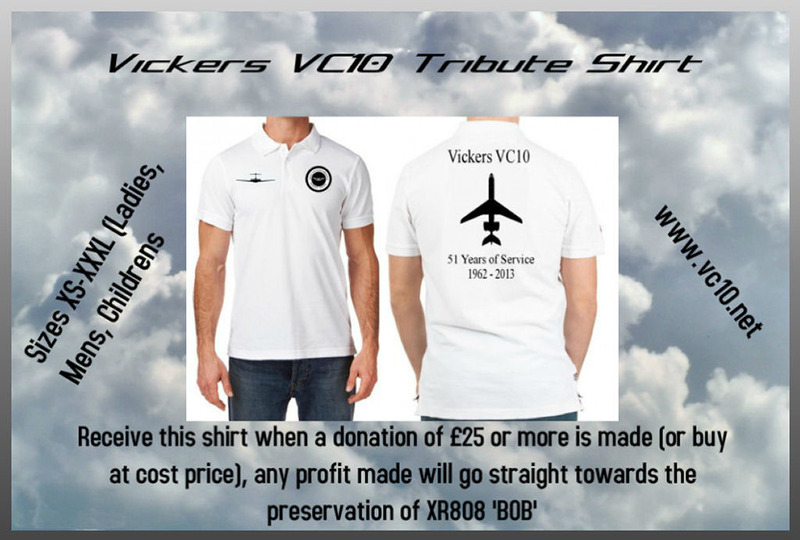 VC10 Tribute Shirt - Order yours now! 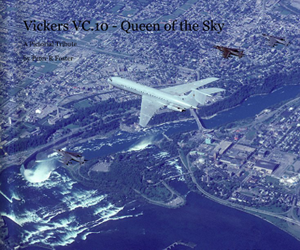 Two of the regular contributors to my forum have taken it upon themselves to organise a tribute t-shirt for the VC10. They designed a white polo shirt with a VC10 on the back and a Vickers-Armstrong logo on the chest as a tribute to the 51 years that the VC10 has served, both as an airliner and a tanker. You can buy this shirt at cost price or for a slightly increased price in which case all the profits will go towards the upkeep of XR808 'Bob' at Bruntingthorpe. They now need orders! So visit the thread in the forum (see link below or above this message) and order yours now! If you don't want to sign up for the forum just for this, e-mail me with the needed details and I'll relay the message. VC10.net forum - VC10 Tribute Shirt - Order Yours Now! On Friday 13th September the two VC10 simulators still in use at RAF Brize Norton will fly their last mission, most likely with a very senior crew up front. After this there will be a small informal ceremony during which the simulators will be powered down for the last time. One of the original installation engineers, who also switched the K Mk3 sim on after installation, will perform the shutdown of this same simulator. This particular simulator was built by Rediffusion in Crawley in 1987. The Brooklands Museum has expressed interest in obtaining one of the simulators. They also operate the Concorde simulator which, although fixed-base, still does a great job of simulating the fastest British airliner ever built. With the VC10 being the next fastest it would make a fitting line up. 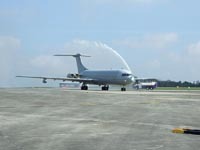 Exciting news.... On Wednesday August 28 the Classic Air Force is receiving a Vickers VC10! The aircraft (ZA148) will be arriving from RAF Brize Norton at the end of its last flight and will go on display at the CAF hangar. Don't miss this chance to see her land for the final time. This wonderful news means that this ex-EAA airliner, which started life as 5Y-ADA, will have a safe future with its new owners and will probably go undercover in their large hangar as well. What more can a VC10 wish for? This leaves just two airframes' futures unsecured, but the rumours that have turned up over the past two days do point towards some good news on this front. Some sources state that the RAF Museum at Cosford will take on one of the remaining K3s and that the other one will go to the North Atlantic Aviation Museum in Gander, Canada. If this is true then no more VC10s will be arriving at Bruntingthorpe for scrapping but all the remaining flyers will have a home. 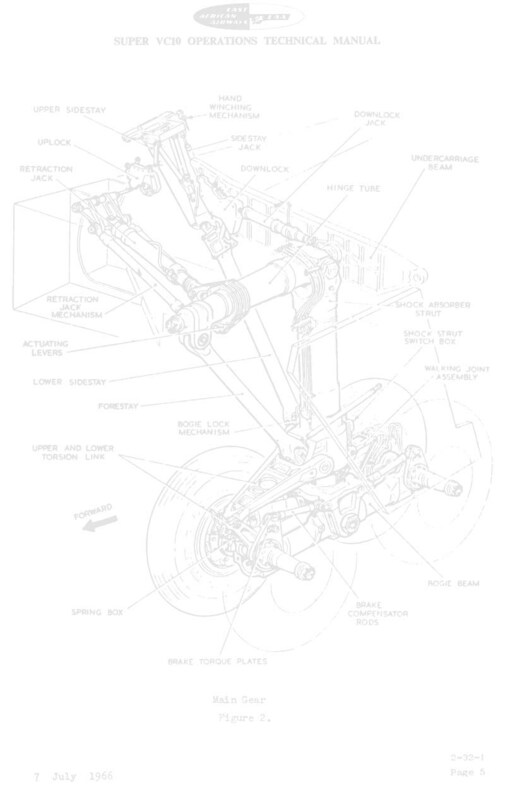 There are also rumours about cockpits of VC10s going to various places but for now nothing has been confirmed, also the future of XR808 and ZD241, both of which have been earmarked for preservation at Bruntingthorpe, is still not clear. For now we'll continue celebrating ZA148's good fortunes and will keep our ears open for other developments. Delivered in 1966, after 43,865 hours of flying time the last of the original RAF VC10s has touched down for the final time. XR808 left RAF Brize Norton around 11:00am and performed a go-around before landing at Bruntingthorpe around 11:30. 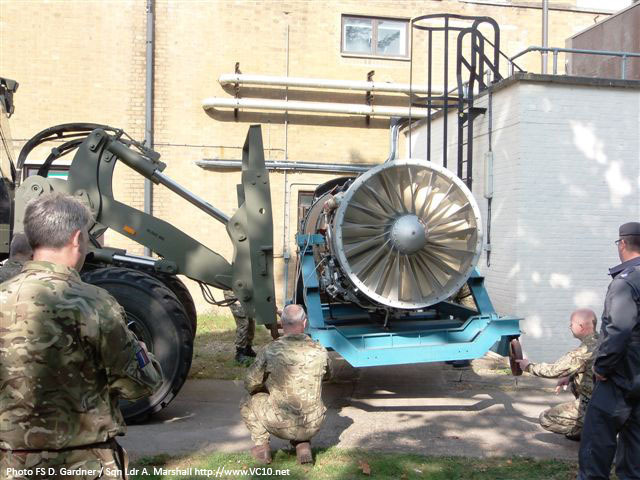 This marks the end of 47 years of continuous service with the RAF for this airframe. Three VC10s are still in service and will continue until an unconfirmed out of service date around 20 September, with final flights on 23 September (although the RAF news now talks about October, see link above). Until then ZA147 will be at the Falkland Islands for which destination she left this same morning, relieving ZA150 which is currently stationed with 1312 Flight at RAF Mount Pleasant. When ZA150 gets back to the UK she will join ZA148 at RAF Brize Norton. For quite some time now the last VC10 C1K in service was destined to be preserved at the RAF Museum at RAF Cosford. Over the past days several dates have been mentioned for its final flight which seemed imminent, but in an about turn that was unofficially announced yesterday the airframe seems to be going to Bruntingthorpe instead. The owner of GJD services, the company that is tasked to scrap the VC10 airframes, has posted on the forum here that GJD is hoping to purchase XR808 for inclusion into the Cold War Jets collection as a live airframe. Although no official announcement has been made as far as I can ascertain, this does appear to be a pretty solid story and would mean another twist in the VC10's retirement plans. Over the past year as VC10s have been retired there have been several plans to preserve them. Scottish aviation heritage association Morayvia have attempted to purchase VC10 K4 ZD241 but were sadly unable to come up with the purchase price. In May an announcement was made at Bruntingthorpe that ZD241 would stay live at that airfield, this was confirmed later on in a small article in Flypast Magazine which stated that the airframe had been bought by David Walton, the man behind Avro Vulcan XH558's return to flight. Currently however ZD241 is engineless so it seems that some work may be needed to achieve this goal. Other plans to keep one VC10 airworthy have been put in motion (see the forum on this site for more) but the financial needs for this plan are huge, and will probably not be achieved. 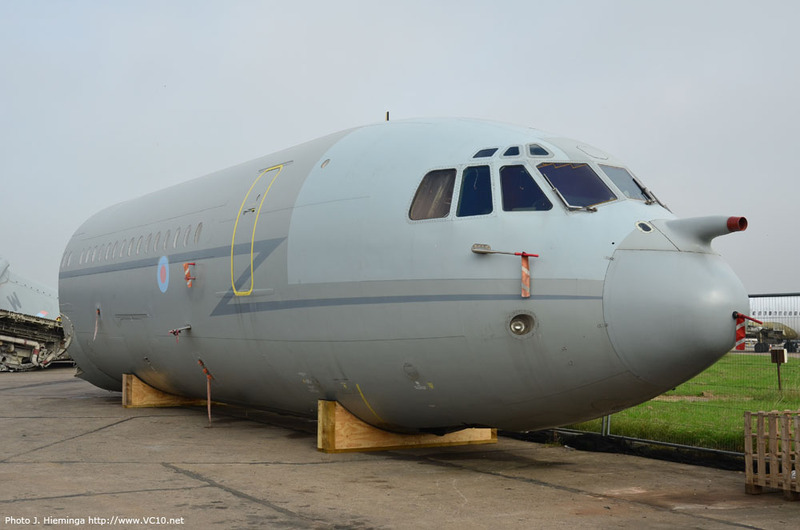 The plan to retire XR808 to Cosford opened a few old wounds which related to the fate of G-ARVM, the previous VC10 which has been at Cosford from 1979 to 2006 when she was reduced to a fuselage only and moved to the Brooklands Museum. Many people hold the RAF Museum accountable for this, and while I argued back then that they could at least have shown some responsibility, it is unfair to put the full blame on them. It was British Airways who owned the airliners at Cosford and who were supposed to look after them, the VC10 did at that point not fit into the RAF Museum's collecting policy and was therefore asked to leave. VC10 C1K XR808 however does fall within this policy and because of this I personally am surprised by this turn of events. After 47 years of loyal service in the RAF surely this airframe deserves a place in a RAF Museum? The RAF have operated 28 of these iconic British airliners over the years which is more than half of the production run of 54. With ZD241 being engineless, the other RAF VC10s going to the scrapper and XR808 due at Bruntingthorpe next week, it looks as if we will only have one complete VC10 to commemorate all those years of RAF VC10 operations, but it will not be in a RAF museum. I'm not saying that XR808 should not be kept live, but right now this is also just a plan and is subject to approval and financial viability. After all the hard work this old lady has done I was hoping its retirement plans would have been more secure. 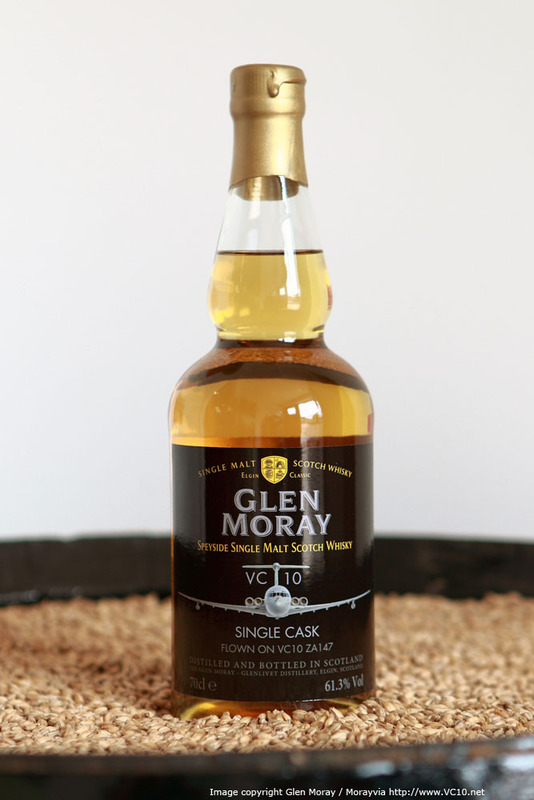 To commemorate the end of the VC10's military service Scottish organisation Morayvia, which looks after Nimrod XV244 and did try to obtain a VC10 as well, have organised a limited edition Glen Moray malt whisky. This will be limited to 242 bottles, each of which will come in a smart presentation box with a numbered label. 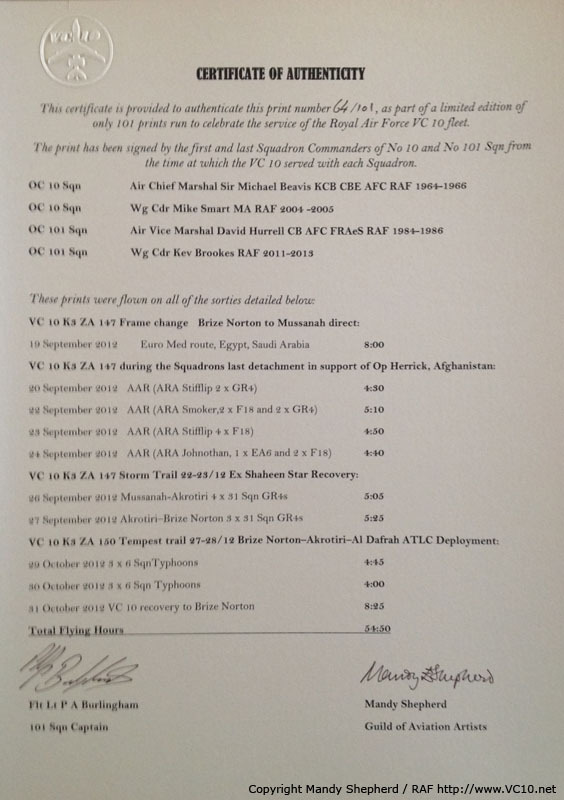 Included is a leaflet which describes the VC10's RAF service and the two squadrons that operated it. All the bottles were recently flown on VC10 K3 ZA147 and this is reflected on the label. The fact that the aircraft burst two tires on landing was a bit worrisome but all the bottles were unscathed! The whisky is a Glen Moray, 10 year old, Cask strength (60.1%) single malt, drawn from a single cask by hand. Bottles will be sold for £90 plus postage and packaging. All the proceeds will be equally divided between Morayvia and the RAF Benevolent Fund. For orders please contact Bob Pountney through e-mail. To celebrate the upcoming final flight of the VC10 in RAF service, a special painting was commisioned from wildlife and military aviation artist Mandy Shepherd. 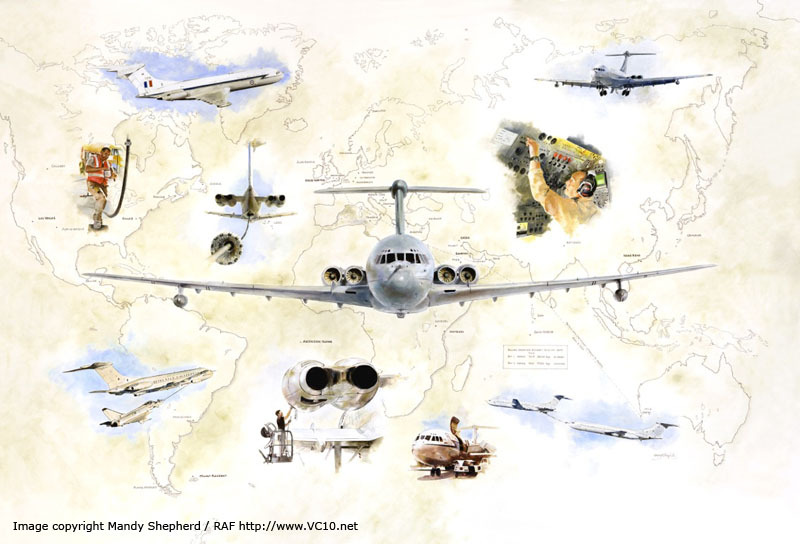 The painting, titled "SHUT DOWN CHECKS COMPLETE", shows a head on view of a VC10 over a large world map with all the theatres in which the VC10 has operated, along with several images showing the different aspects of its service. 1st edition: Two large size prints, both signed by The Prince of Wales and The Princess Royal, which will be retained by squadrons at RAF Brize Norton. 2nd edition: Ten prints sized 845mm x 572mm with remarques and signed by the first and last Sqn commanders from 10 and 101 Sqn, framed, of which no.10 will be auctioned at the last VC10 dinner later this year. 3rd edition: One hundred and one prints sized 631mm x 416mm, signed by the first and last Sqn commanders from 10 and 101 Sqn, framed, of which no.10 and no.101 will be auctioned at the same dinner. Also one unframed print no.64, signed with certificate, which will be available for purchase on Ebay (see below for link). 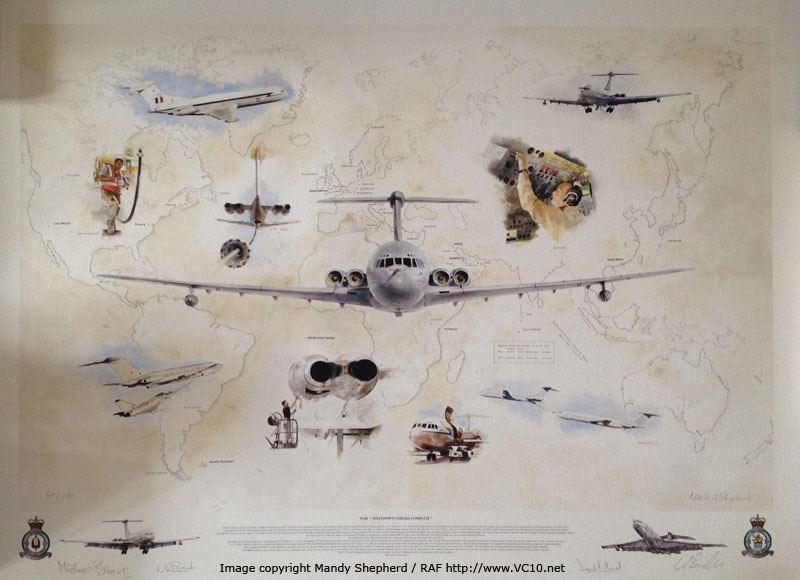 All prints were flown in VC10s during the last year and come with a certificate of authenticity which lists these flights. For more about the artist, go here. The annual Trooping the Colour parade on Saturday 15th June in celebration of HM The Queen's birthday was closed by the RAF's flypast finale. At 1PM a large formation of 30 aircraft flew down the mall and over Buckingham Palace concluding the official celebrations. Element six of the formation consisted of a 216 Squadron Tristar and a 101 Squadron VC10, the RAF's longest serving aircraft. VC10 K3 ZA147 'F' carried out this duty. A photo of the aircraft at Brize Norton prior to departure is here, images showing the formation are on this page. The link at the header of this article goes to the RAF press release, in which ZA147 is labeled as 'The wonderful VC10', we can only second that of course! ZD241, the last BOAC Super VC10, will stay alive! 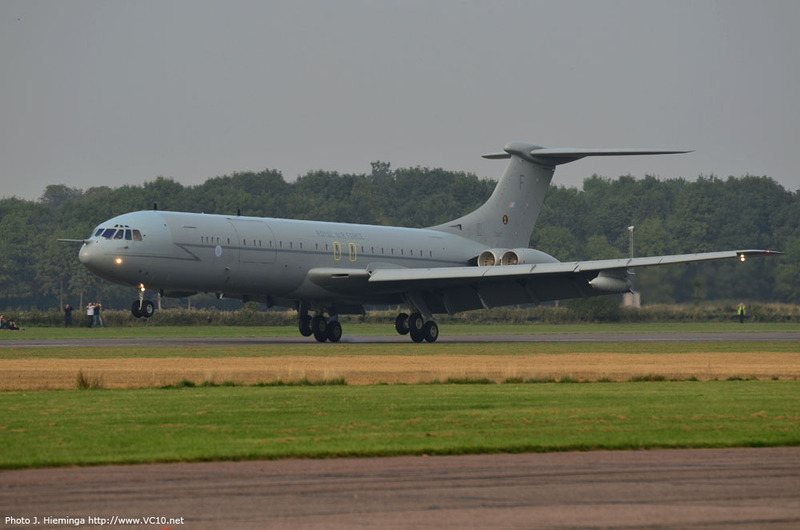 According to a post at FighterControl, an earlier message I received and the announcer at the latest Bruntingthorpe event, ZD241, the last of the K4s, is now set to become the 'live' VC10 at Bruntingthorpe with a first run in August if all goes well. Initially it was thought that this honour would go to a C1K but ex-BOAC G-ASGM will now take this spot. 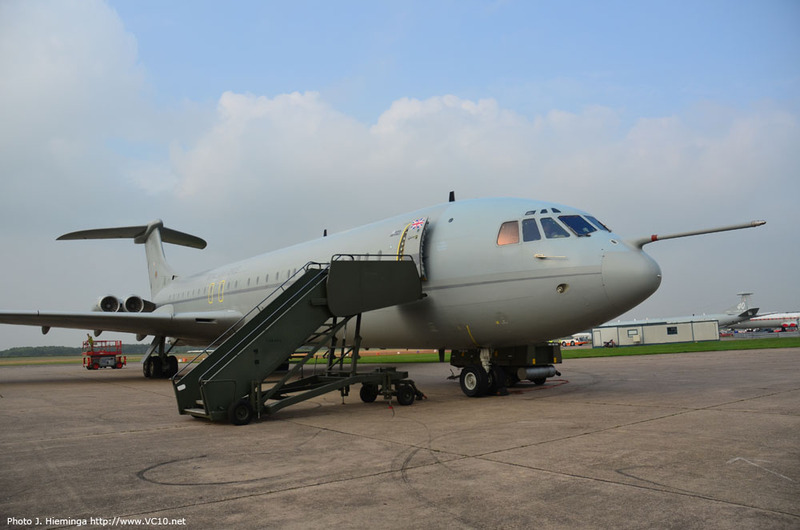 As such the aircraft will be maintained in live condition by GJD services, the company responsible for scrapping the retired VC10s which is also a licensed maintenance facility. Although the original date for its final flight, which was Wednesday 20th March, came and went, the last BOAC Super VC10 still in active service performed its final flight on 21st March 2013, landing for the final time at Bruntingthorpe. Its original first flight took place on 26 February 1968 which was 45 years ago last month. Between 1968 and 1981 it flew for BOAC and later British Airways as G-ASGM. The RAF purchased the airframe along with the rest of the British Airways Super VC10 fleet and in the early nineties it was ferried to Filton for conversion into a K4 tanker. It performed a second first flight as a tanker on 10th May 1995 and was delivered to 101 Squadron a month later. It then spent the next 18 years delivering fuel to various military jets all over the world, most recently around the Falkland Islands as part of 1312 Flight at RAF Mount Pleasant. Final landing of K4 ZD241. 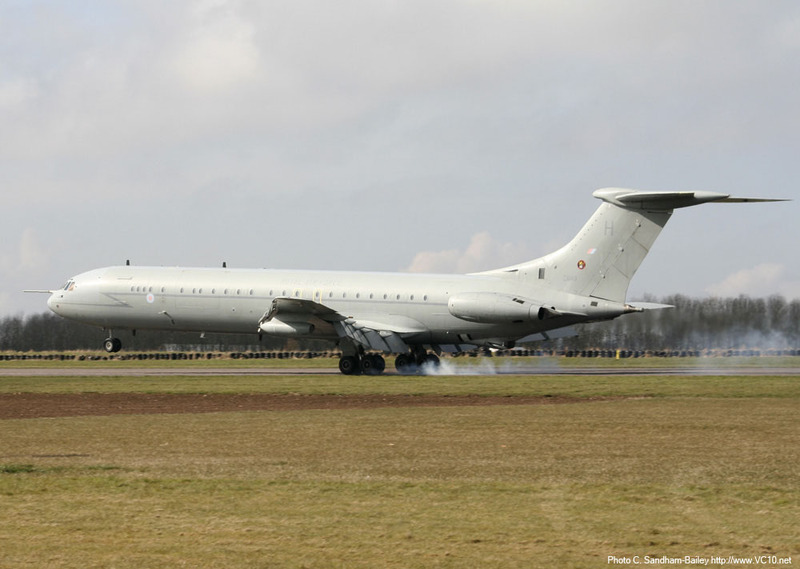 Ex-East African Airways Super VC10 ZA149, formerly known as 5X-UVJ, flew to Bruntingthorpe on Monday 18th March, performed several passes with the gear up followed by a low approach with the gear down and finally its final landing around 13:30. This marks the end of the line for what the OC 101 Squadron described as one of his 'Supertankers'. Chris Sandham-Bailey took the photo below of this sad moment. Click here to read the RAF news release about this last flight. ZA149 performed several flypasts before landing. Final landing of K3 ZA149. With the extension to the VC10's service life which was announced earlier, I for one thought that the final six airframes would continue to operate until the final day of VC10 operations. As it turns out this is not the case. Next week, on Monday 18th March and Wednesday 20th March the final K4 airframe ZD241 and a K3, ZA149, will be retired to Bruntingthorpe. ZD241 started its life in February 1968 and was delivered to BOAC a month later as G-ASGM. As such she is the last of the original BOAC airframes still operational. Having been retired in 1981 the aircraft stood idle for almost ten years before being ferried to Filton for conversion, re-emerging as a VC10 K4 tanker in May 1995 with the accolade of being the K4 with the shortest time between first flight and delivery. This relatively trouble-free development period may have been a precursor to its long service life, surviving beyond all the other K4s. 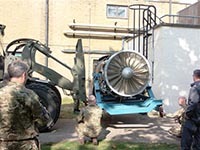 In recent years ZD241 spent a lot of time at RAF Mt. Pleasant airfield on the Falkland Islands, flying home for the last time on 8th March. In contrast the history of ZA149 is distinctly different. Having been built as the 'ultimate Super VC10', the type 1154 for East African Airways, she was delivered as 5X-UVJ in April 1969 and started flying the African skies. After a relatively short career the aircraft was reposessed by BAC in 1977 upon the collapse of the airline and was sold to the RAF for conversion to a tanker. Its second first flight was on 25th March 1985 and delivery to the then recently reformed 101 Sqn occured on 14th May 1985. So by now she has been flying as a tanker for almost 28 years, having been an airliner for only 8 years. If any more details about the deliveries become available they will probably be posted on the website Facebook page or the forum, see the links above. Although I'm a bit late in posting this, it is never too late to mention good news: the out of service date for the VC10 has now officially been postponed until September 2013. The article linked to above talks about a review of the UK's defence needs and the status of the slipped A400M and Voyager projects, which is the reason that there may be a capability gap in tactical air transport and air-to-air refuelling. Because of this the VC10 will get to fly on a bit longer but other measures are also being taken, one being a similar extension to the planned in service life of the Tristar. The announcement that there will be a VC10 at RIAT was a pretty sure sign but this article further confirms this rumour. We will get to enjoy the sound of four Conways a little while longer.